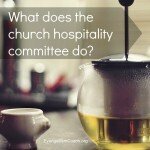 What does the church hospitality committee do? I’ve spoken with several committees over the last few years in my coaching phone calls about their church hospitality program. Where do we start with our church hospitality program? You don’t want to re-create the wheel. [Read more…] about What does a church hospitality committee do?